According to the article, “The Sky is Falling” in TheAtlantic.com there are 5,388 Near-Earth asteroids and comets known to exist with 741 at least one-kilometer across or more. So whats chilling about this? NASA defines a global calamity asteroid as one one-kilometer across or more. That means we have 741 chances of Doomsday by astrological causes. Many scientist and geologist believe that this is what caused the mass extinction of the dinosaurs and the ice age. So you might be asking yourself, the chances of a collision are pretty low, so lets assume its not going to impact and just flyby, what then? According to Lawrence Berkeley National Laboratory, in California, this exact scenario happened almost 13,000 years ago with the passing of two large space rocks. This flyby lead to erratic global climate changes and ultimately the extinction of many plant and animal species. Earth asteroid impacts have been understated in the media and through our educational system, we need to rethink the idea that we are independent from the harms of the space system and realize that we are part of this system where harm can come beyond Earth. As tornadoes and tsunamis affect us on a micro-global scale, asteroids and comets affect us on a macro-global scale. Most of us think of the our existence as a one system entity where earth is the system and what goes on in the earth are the changes to the system. But we need to break that and start to image our reality as a two system entity where yes, we do have changes on the system on Earth but there is a larger system of the universe that be belong to. Both of these systems work simultaneously together and are dependent; We can’t ignore this system or else we wont be prepared when doomsday comes. Breakthrough ideas have a way of seeming obvious in retro­spect, and about a decade ago, a Columbia University geophysicist named Dallas Abbott had a breakthrough idea. She had been pondering the craters left by comets and asteroids that smashed into Earth. Geologists had counted them and concluded that space strikes are rare events and had occurred mainly during the era of primordial mists. But, Abbott realized, this deduction was based on the number of craters found on land—and because 70 percent of Earth’s surface is water, wouldn’t most space objects hit the sea? So she began searching for underwater craters caused by impacts rather than by other forces, such as volcanoes. What she has found is spine-chilling: evidence that several enormous asteroids or comets have slammed into our planet quite recently, in geologic terms. If Abbott is right, then you may be here today, reading this magazine, only because by sheer chance those objects struck the ocean rather than land. Abbott believes that a space object about 300 meters in diameter hit the Gulf of Carpentaria, north of Australia, in 536 A.D. An object that size, striking at up to 50,000 miles per hour, could release as much energy as 1,000 nuclear bombs. Debris, dust, and gases thrown into the atmosphere by the impact would have blocked sunlight, temporarily cooling the planet—and indeed, contemporaneous accounts describe dim skies, cold summers, and poor harvests in 536 and 537. “A most dread portent took place,” the Byzantine historian Procopius wrote of 536; the sun “gave forth its light without brightness.” Frost reportedly covered China in the summertime. Still, the harm was mitigated by the ocean impact. When a space object strikes land, it kicks up more dust and debris, increasing the global-cooling effect; at the same time, the combination of shock waves and extreme heating at the point of impact generates nitric and nitrous acids, producing rain as corrosive as battery acid. If the Gulf of Carpentaria object were to strike Miami today, most of the city would be leveled, and the atmospheric effects could trigger crop failures around the world. What’s more, the Gulf of Carpentaria object was a skipping stone compared with an object that Abbott thinks whammed into the Indian Ocean near Madagascar some 4,800 years ago, or about 2,800 B.C. Researchers generally assume that a space object a kilometer or more across would cause significant global harm: widespread destruction, severe acid rain, and dust storms that would darken the world’s skies for decades. The object that hit the Indian Ocean was three to five kilometers across, Abbott believes, and caused a tsunami in the Pacific 600 feet high—many times higher than the 2004 tsunami that struck Southeast Asia. Ancient texts such as Genesis and the Epic of Gilgamesh support her conjecture, describing an unspeakable planetary flood in roughly the same time period. If the Indian Ocean object were to hit the sea now, many of the world’s coastal cities could be flattened. If it were to hit land, much of a continent would be leveled; years of winter and mass starvation would ensue. Other scientists are making equally unsettling discoveries. Only in the past few decades have astronomers begun to search the nearby skies for objects such as asteroids and comets (for convenience, let’s call them “space rocks”). What they are finding suggests that near-Earth space rocks are more numerous than was once thought, and that their orbits may not be as stable as has been assumed. There is also reason to think that space rocks may not even need to reach Earth’s surface to cause cataclysmic damage. Our solar system appears to be a far more dangerous place than was previously believed. Beyond the Kuiper Belt may lie the hypothesized Oort Cloud, thought to contain as many as trillions of comets. If the Oort Cloud does exist, the number of extant comets is far greater than was once believed. 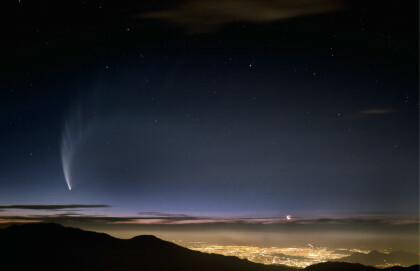 Some astronomers now think that short-period comets, which swing past the sun frequently, hail from the relatively nearby Kuiper Belt, whereas comets whose return periods are longer originate in the Oort Cloud. In 1980, only 86 near-Earth asteroids and comets were known to exist. By 1990, the figure had risen to 170; by 2000, it was 921; as of this writing, it is 5,388. The Jet Propulsion Laboratory, part of NASA, keeps a running tally at http://www.neo.jpl.nasa.gov/stats. Ten years ago, 244 near-Earth space rocks one kilometer across or more—the size that would cause global calamity—were known to exist; now 741 are. Of the recently discovered nearby space objects, NASA has classified 186 as “impact risks” (details about these rocks are at http://www.neo.jpl.nasa.gov/risk). And because most space-rock searches to date have been low-budget affairs, conducted with equipment designed to look deep into the heavens, not at nearby space, the actual number of impact risks is undoubtedly much higher. Extrapolating from recent discoveries, NASA estimates that there are perhaps 20,000 potentially hazardous asteroids and comets in the general vicinity of Earth. There’s still more bad news. Earth has experienced several mass extinctions—the dinosaurs died about 65 million years ago, and something killed off some 96 percent of the world’s marine species about 250 million years ago. Scientists have generally assumed that whatever caused those long-ago mass extinctions—comet impacts, extreme volcanic activity—arose from conditions that have changed and no longer pose much threat. It’s a comforting notion—but what about the mass extinction that occurred close to our era? About 12,000 years ago, many large animals of North America started disappearing—woolly mammoths, saber-toothed cats, mastodons, and others. Some scientists have speculated that Paleo-Indians may have hunted some of the creatures to extinction. A millennia-long mini–Ice Age also may have been a factor. But if that’s the case, what explains the disappearance of the Clovis People, the best-documented Paleo-Indian culture, at about the same time? Their population stretched as far south as Mexico, so the mini–Ice Age probably was not solely responsible for their extinction. A team of researchers led by Richard Firestone, of the Lawrence Berkeley National Laboratory, in California, recently announced the discovery of evidence that one or two huge space rocks, each perhaps several kilometers across, exploded high above Canada 12,900 years ago. The detonation, they believe, caused widespread fires and dust clouds, and disrupted climate patterns so severely that it triggered a prolonged period of global cooling. Mammoths and other species might have been killed either by the impact itself or by starvation after their food supply was disrupted. These conclusions, though hotly disputed by other researchers, were based on extensive examinations of soil samples from across the continent; in strata from that era, scientists found widely distributed soot and also magnetic grains of iridium, an element that is rare on Earth but common in space. Iridium is the meteor-hunter’s lodestar: the discovery of iridium dating back 65 million years is what started the geologist Walter Alvarez on his path-breaking theory about the dinosaurs’ demise.